September 5, 2016 in Articles, Features. Latest news on the fundraising campaign to get a car/ambulance for Dr. Chuga. Just £3,000 needed to reach the target! Great news! We have now raised about £7,000 (still £3,000 to go) for the vehicle thanks to the many very generous donations given so far. If you are still considering donating to this very worthy project please donate here Dr. Chuga ambulance/car and if you pay UK tax and would like us to claim 25% extra on your donation please consider filling out a gift aid form downloadable here: Gift_Aid. 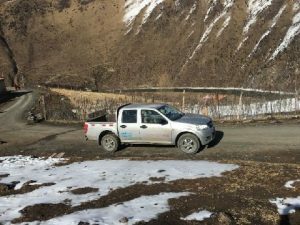 Everyone in the Rigul Trust team are very grateful for your generosity to the people in the remote region of Rigul in Tibet who will soon be able to benefit from the all terrain vehicle used as an ambulance and to collect the mountain herbs necessary for the clinic. Thank you so much and much joy to you!